Outdoor rugs need to be able to survive life outside the protection of your roof and walls. If you’re thinking, “Shouldn’t all outdoor rugs be durable? They’re outdoor rugs, for crying out loud,” we hear you. But each rug owner’s expectations for feel, style, and general compatibility of a rug with their lifestyle are all unique. 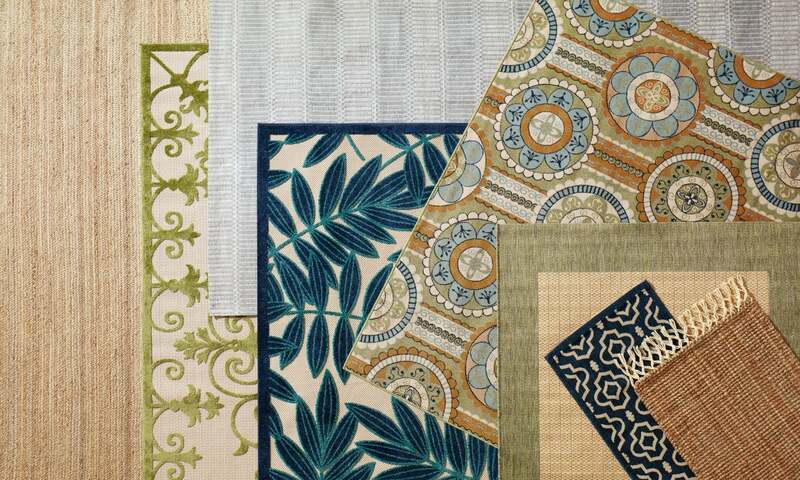 There are different options for outdoor rug materials, and what you choose should depend on where you plan to use the rug and how you want it to look. Synthetic materials are inexpensive, light, and tend to dry quickly. They’re not super plush and you won’t sink into them, but most outdoor rugs are that way. So if you have a vision of yourself cuddled up on the porch swing with a blanket and a cup of coffee, nestling your toes in between the fluffy fibers of an outdoor rug, try one made with polypropylene. This material is strong, comfy, and has a great texture that mimics wool, so it stands up to storms and other weather. The wrong outdoor rug can get moldy when exposed to moisture, so choose polypropylene if you expect a decent amount of precipitation. If you’re dreaming of a resort-like exterior filled with natural fibers, unfortunately jute and seagrass are big no-nos when it comes to outdoor rugs. Bamboo and sisal can thrive under a covered porch, but never poolside. They’ll mildew if they take in too much moisture, and fade in too much sunlight. 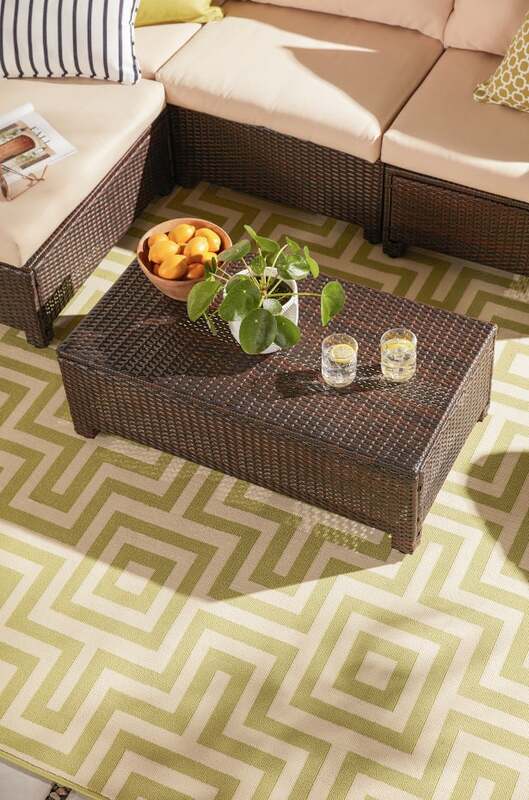 The best fade-resistant outdoor rug material is polyester. It’s also stain resistant, unless oil-based spills are involved. While polyester outdoor rugs are more prone to shedding and pilling in high traffic, they’re fire retardant, should the grill flare up or those tiki torches tip. For something pet friendly, elastic, anti-microbial, and weatherproof, get an outdoor rug made from at least one synthetic material. All the best indoor/outdoor rugs are. Is an outdoor rug a good idea? When it’s time to shake out the beach towels and roll out the bar carts, a summery textile will extend your living space, but you might feel like you’ve just created one more area to maintain. The easiest way to care for an outdoor rug is to prevent it from getting dirty in the first place. Accidents happen. No way around it. But you can clean up spills as quickly as possible to prevent them from setting. Vacuum regularly to keep dirt and debris from getting ground into the fibers. Sweep underneath the rug occasionally to prevent damage from dirt and debris caught beneath it. If your rug is water resistant, then you can place it over a railing or on an incline and hose it down. That’ll come in handy when your kids track mud all over it or Fido knocks your dinner plate onto the ground. For stubborn stains, scrub the rug with a brush and a solution of mild dish soap and water. Avoid soap that contains bleach. You’ll want to make sure both sides of your rug are dry before you put it back on the floor to prevent mildew. Roll up your rug and put it in storage during extreme weather and when you know you won’t be using it for long periods of time. Read our tips on How to Clean an Outdoor Rug for more helpful information on outdoor rug care. Maintenance will vary with your outdoor rug material. With all the dirt and dust mites you bring into your home from family hikes or the kids’ soccer practice, it’s good to have a sturdy rug that can be thrown in the wash and then hung to dry. And because outdoor rugs are made to withstand wear and tear, they make excellent kitchen, dining, and bathroom rugs. So if you’ve found a texture, pattern, or color that you love in an outdoor rug, there’s no reason not to use it inside. Darker rugs will create more intimacy, and lighter shades can open up a small area. If you’re going for a layered boho look in your living room, toss in a few outdoor flatweave rugs and top them with scattered floor lanterns and pillows. While leafy vines and florals are popular patterns for an outdoor tropical paradise, you can become one with nature in your own home by bringing an outdoor rug inside. Because outdoor rugs are often reversible, you can just flip the dirty sides and deal with them later. Will your whole family be trudging in from flag football on Thanksgiving Day? 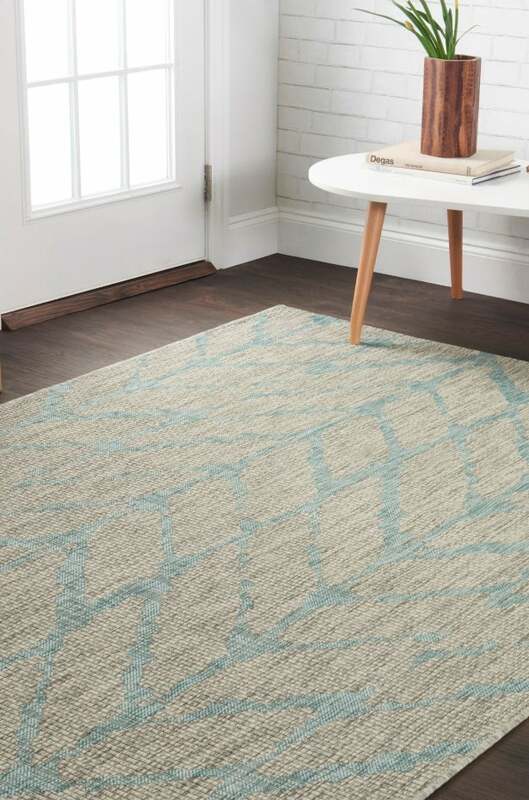 Use your rug in your entryway to guard against mud tracks. Make sure to get an appropriate rug pad to protect your floor and prevent slipping, and be aware that some outdoor rug materials shed more than traditional indoor rugs. For a more in-depth look at how to pick the perfect outdoor rug for your patio area, check out our Tips on Buying Outdoor Rugs.